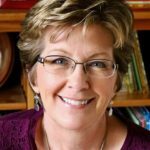 Over the years, I’ve shared many of the books I love on Picture Book Builders. 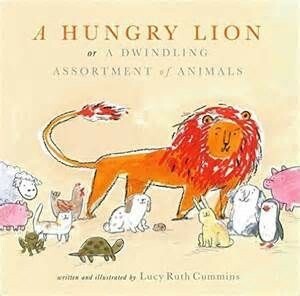 There was A Hungry Lion: A Dwindling Assortment of Animals, written and illustrated by Lucy Ruth Cummins. I love that it’s subversive, funny, and unexpected. 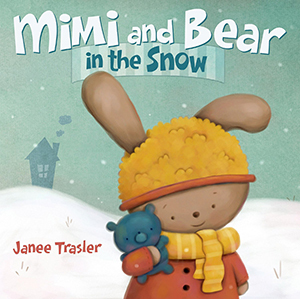 There was Mimi and Bear in the Snow, written and illustrated by Janee Trasler. I adore its sweet simplicity. 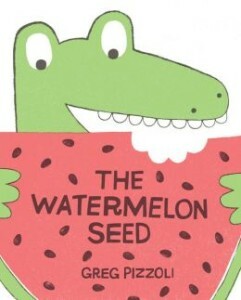 There was The Watermelon Seed, written and illustrated by Greg Pizzoli. Oh, people, I am crazy about how Crocodile’s personality shines on every single page. It’s amazing to think that each of these books started with the exact same thing—an idea. A couple of months ago, I got a new idea for a picture book. This was such a great moment for me as it is really hard for me to get a good idea. I fanned that idea. I brainstormed. I mapped out a first draft. And a second. And a third. I was in the zone! I played with words. I tightened. I polished. I amped up the humor. I shared the manuscript with my critique group and another writer friend. The manuscript got better because of these people. I revised some more. Then I sent it to my agent. She had lovely things to say, but she also had some great suggestions for improvement. I dug back in. I worked and worked, and the manuscript improved some more. I was this close to telling my agent I thought it was ready to send Out There. I had this unsettling feeling that the manuscript was missing something. Something big. It took some time, but I finally figured it out. This manuscript had a lot going for it, but I didn’t love it. It didn’t make my heart pound the way books like A Hungry Lion, Mimi and Bear in the Snow, and The Watermelon Seed do. More than anything, I felt indifferent about my latest project. And readers deserve better than books an author feels indifferent about. So I made the decision to let it go. Yes, I spent hours and hours and hours on that manuscript. But here’s the thing. That time wasn’t wasted. I was just putting in some writing practice. This manuscript will never be a book, but it did something great. It pushed me a step closer toward making the next one. One I hope to love. Congratulations to Cathy Ballou Mealey! 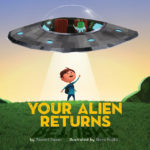 She won a signed copy of Your Alien Returns and an alien of her very own. Greg Pizzoli, Janee Trasler, Lucy Ruth Cummins, Tammi Sauer. Bookmark. I’ve got a few of those in a file also. The ones you work so hard for. It hurts to let them go. I’ve tried writing them in different ways. Tried writing them in rhyme. I’ve even combined them with the other stale Ms in the same file. But it is true, some you just have to let go. Say bye, bye babies. Not a forever bye, bye. Just a I’ll miss you bye, bye. Maybe we’ll click some day bye, bye. There is some consolation in knowing other (famous) writers have the same experience. Yes. We are in good company! Thank you for this post! So much of a writer’s work is practice, and I feel like this is undervalued. Maybe because it takes patience and is not directly rewarded. I often think about how much time musicians spend practicing. Putting in the practice is so important! Jill–Ouch! But yes. I needed to hear this. Thanks! This business is filled with great moments. And tough ones. That is so true, Tammi. That special little “ping” of excitement needs to be there each time we read our manuscript to let us know…this is it! Thanks! Yes! The ping is crucial! I absolutely love A Hungry Lion–it’s so funny and well done with a great twist of an ending. I’ll have to re-visit the Watermelon Seed. Thanks for recommending Mimi–haven’t read that one yet, Tammi, so I’ll be putting it on my library request list ASAP! Can’t wait for your new lion book! Yes, I feel REALLY lucky! Come over and I’ll make tea. We can read it together! Ugh, Tammi. This happens to me, too. And I hate it at first, because it’s so disappointing to move a story from a prominent place on my desktop into that close-but-no-cigar file (that I promise to come back to even as I know I never will). But it’s surprising how fast we can dismiss ALL THOSE HOURS and just let them go, isn’t it? Practice truly is a NECESSARY part of writing. I love this reminder. And there’s always another idea just around the bend. Thank goodness. It’s funny you should mention A Hungry Lion. When that book came out, I had to let go of a story that I had been working on for a while. I liked it, but it was pretty much the same story (in some parts word for word). Mine just featured a different hungry animal. It’s all good practice! As I was reading how Tammi worked and worked on her manuscript, and how she revised and shared it with others, and sent it to her agent etc… I was thinking “Oh please don’t tell me it wasn’t successful.” When I read the line, “So I let it go.” I said to myself, “Nooooo! !” Not only am I sad for Tammi, it reminds me of my struggle with MY favorite manuscript and how I don’t want to let it go. Nor can I. I have to have hope!! I need the happy ending! Thanks for the pb suggestions, though. I will be checking those out of the library very soon. And I’m very hopeful my next ms gives me that 100% YES feeling. I hope you will be featured again on PBB soon because I want to know the title of the story that finally sold and how it differs from the original that you worked on for years. SQUEEE! I get my own alien? Really truly? I’m so excited. We are going to be the best of friends – I just know it! Please pass along your snail mail address. Thanks, Tammi, for sharing that difficult process. You’re welcome. Thanks for stopping by PBB! I hope parts of that ms make it into a book someday. I liked it! The first manuscript I wrote is one of those. It’s in a drawer right now, until it’s ready, until I’m ready. I’d guess I need more writing skills to bring it to the point where I can get it out again and send it off. Yes, sometimes a little time and distance from a ms is exactly what is needed. What a great reminder of what can happen with some stories, Tammi. I tell my students these are “learning stories” that serve the important purpose of giving us writing practice. As much as we’d love for everything we write to get published, that just isn’t the reality! Thanks, Tammi. “Let it go” is good advice. Your hard work and advice to us helps us see how to keep writing and learning. You are a great mentor. Oh, Tammi, thanks for sharing your journey on this “practice” book. It’s wonderful learning that this happens to successful authors, and that I’m not alone. I may soon be saying good by to my heart-favorite. So sad. Thanks for sharing. Maybe your heart-favorite will just be goodbye for now. Maybe it’ll be a manuscript you one day come back to…. Thanks for sharing, Tammi. Non-success stories are almost more valuable than success stories for those of us struggling to learn how to write in this genre. Ah yes, letting go can be tough to do. But you’re right, writing time is never wasted. I think you hit on a key point, Tammi. You were able to recognize that you didn’t love your story, that it didn’t have the ZING of a great story the way those you admire did. That takes deep honesty as a writer–we are often guilty of being too in love with our own words. Thank you (and Jill and Linda and all the other writers who commented) for sharing your experiences and showing how this honesty pays off in the long run.